“Micah watches over spiritual evolution, seeking every opportunity to reveal the next steps of your life purpose. This lifetime represents only a small part of your Divine Plan, which directs you through many specific experiences to become everything you were intended to be. When at last you release enough emotional baggage to feel your purpose, you realize that it is what you wanted all along. Everything yo do, think, say, feel, experience and desire is recorded as your complete life history in the Akashic Records. 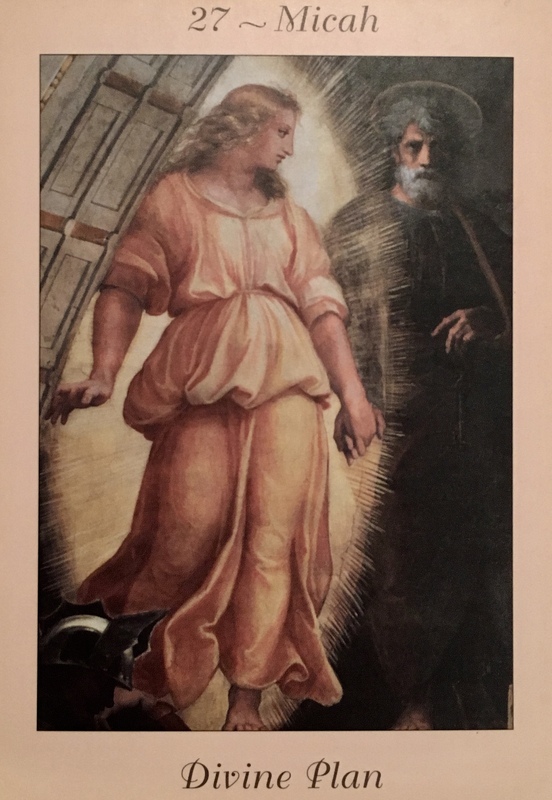 Prior to each embodiment, the Kindel Angel who is in charge of your entire evolution meets with you to discuss the needs, desires ad karmic consequences of your next lifetime. The Kindel then forms your Incarnation Disc, holding information about your destiny – important people you will meet, major events such as crises of spiritual consequence, health issues including the duration of your life, and karmic indebtedness that remains to be worked out. This disc made of mental substance is placed in your mental body in the proximity of your heart. Your destiny patterns consist of Filled Keys which activate predestined events, giving you a deeper understanding of your major issues, and unpatterned Open Keys. When you merit an Open Key, you step outside the influence of your past. You decide what your new attitudes and focus will be. Your Guardian Angel may present exciting opportunities along with the option to deepen your dedication to spiritual growth. The angels and other spiritual beings love these times when you are not affected by planned events because they can introduce new teachers and friends, help you discover innovative job options, and expand your awareness. Open Key periods are often difficult because everything familiar falls away and you feel adrift. To your Eternal Self, these moments are cherished above all others. Pay close attention to knowing your truth during these times. Your actions, reactions, and decisions will greatly alter your future as you move more quickly through the karmic indebtedness of your Filled Keys. Filled Keys use the force of magnetic attraction to reacquaint you with individuals from past lives with whom you have unfinished business. The events of these circumstances will be similar to the last time you met, given you a chance to break the cycle of repetition and conquer the issue. Your health challenges will be comparable to those you were unable to overcome before, letting you find new understanding and heal. You will also receive the blessings and advancements you have earned in the past. Although this may sound as if things are pretty well set, YOU have a great deal to do with your progress. You can either repeat old patterns, or consecrate your life to breaking free. Take responsibility for yourself and be determined to clear out everything that holds you in a life that isn’t right for you. This requires a new level of brutal but loving honesty. Your emotions are your connection to divine will. In every experience, God’s Spirit passes from your feelings to your mind. When the mind misunderstands or doesn’t like the feelings it receives, it takes control giving your will instructions not to feel the way it does. After that your will follows the instructions of the mind ignoring the truth. Your real feelings are denied. Issues that you face in the Filled Keys center around these denials. Certain behavior patterns become so automatic you don’t even realize what is happening. Once you allow yourself to feel and express the full intensity of your undesirable feelings with acceptance, the rigid energy structures that have perpetuated the behavior release and allow the flow of true feelings, guiding you to the fulfillment of your Divine Plan! This is a slow process and there is more to heal than you would like to think. Be patient and love yourself. As you release, your true feelings may tell you things you don’t want to know. If you do not at on these feelings, you are again denying them. They are your guide to your right place and happiness in life. You may need to end relationships, change your career, or move and leave friends behind. These changes may seem difficult, but they are freeing you from people, activities and things that are a part of the pretense and are not really you. Open your heart and mind to hep recognize your right place and create the life you want. More shifting, more changing, more upheaval… it’s only chaos if you let it confuse and frighten you… if you embrace it it instead becomes the adventure of a lifetime. It’s all about perspective. Are you swimming downstream, maybe a little shocked at just how fast things are moving? Or are you clinging on for dear life, struggling, grasping, refusing? It’s all up to you. How to handle all this energy coming in… as a gift or as a curse. Only you know in your heart what’s going on and maybe, just maybe why. Are you trusting that all will work out for the Highest Good of All? Have you released all vestiges of victimhood? Have you embraced your new path as spiritual warrior? Have you taken time to just breathe? To just be? You could choose, right now, to make the absolute most of jumping right out of your comfort zone for good. Like permanently. How much good was it really doing you anyway? Weren’t you feeling kind of stuck? Kind of like there was something else you should be doing? Like you were waiting for something to happen? You make it happen. By taking the leap of faith into the great unknown. Is that your Soul I hear singing?